For the contemporary Germanic dialect group in northern Italy, see Cimbrian language. The Cimbri (Greek κίμβροι, Latin Cimbri) were an ancient tribe. They are generally believed to have been a Germanic tribe originating in Jutland, but Celtic influences have also been suggested. Together with the Teutones and the Ambrones, they fought the Roman Republic between 113 and 101 BC. The Cimbri were initially successful, particularly at the Battle of Arausio, in which a large Roman army was routed, after which they raided large areas in Gaul and Hispania. In 101 BC, during an attempted invasion of Italy, the Cimbri were decisively defeated by Gaius Marius, and their king, Boiorix, was killed. Some of the surviving captives are reported to have been among the rebelling gladiators in the Third Servile War. The origin of the name Cimbri is unknown. One etymology is PIE *tḱim-ro- "inhabitant", from tḱoi-m- "home" (> English home), itself a derivation from tḱei- "live" (> Greek κτίζω, Latin sinō); then, the Germanic *himbra- finds an exact cognate in Slavic sębrъ "farmer" (> Croatian, Serbian sebar, Russian сябёр syabyor). The name has also been related to the word kimme meaning “rim”, i.e., "the people of the coast". Finally, since Antiquity, the name has been related to that of the Cimmerians. Himmerland (Old Danish Himbersysel) is generally thought to preserve their name; Cimbri with a c would be an older form without Grimm's law (PIE k > Germ. h). Alternatively, Latin c- represents an attempt to render the unfamiliar Proto-Germanic h = [x] (Latin h was [h] but was becoming silent in common speech at the time), perhaps due to Celtic-speaking interpreters (a Celtic intermediary would also explain why Germanic *Þeuðanōz became Latin Teutones). Because of the similarity of the names, the Cimbri have been at times associated with Cymry, the Welsh name for themselves. However, Welsh Cymry is derived from Brittonic *Kombrogi, meaning “compatriots”, and is linguistically unrelated to Cimbri. The Cimbri are generally believed to have been a Germanic tribe originating in Jutland. Though Celtic origins have been suggested, this is controversial. Archaeologists have not found any clear indications of a mass migration from Jutland in the early Iron Age. The Gundestrup Cauldron, which was deposited in a bog in Himmerland in the 2nd or 1st century BC, shows that there was some sort of contact with southeastern Europe, but it is uncertain if this contact can be associated with the Cimbrian expedition. My fleet sailed from the mouth of the Rhine eastward as far as the lands of the Cimbri, to which, up to that time, no Roman had ever penetrated either by land or by sea, and the Cimbri and Charydes and Semnones and other peoples of the Germans of that same region through their envoys sought my friendship and that of the Roman people. As for the Cimbri, some things that are told about them are incorrect and others are extremely improbable. For instance, one could not accept such a reason for their having become a wandering and piratical folk as this that while they were dwelling on a Peninsula they were driven out of their habitations by a great flood-tide; for in fact they still hold the country which they held in earlier times; and they sent as a present to Augustus the most sacred kettle in their country, with a plea for his friendship and for an amnesty of their earlier offences, and when their petition was granted they set sail for home; and it is ridiculous to suppose that they departed from their homes because they were incensed on account of a phenomenon that is natural and eternal, occurring twice every day. And the assertion that an excessive flood-tide once occurred looks like a fabrication, for when the ocean is affected in this way it is subject to increases and diminutions, but these are regulated and periodical. On the map of Ptolemy, the "Kimbroi" are placed on the northernmost part of the peninsula of Jutland., i.e., in the modern landscape of Himmerland south of Limfjorden (since Vendsyssel-Thy north of the fjord was at that time a group of islands). Some time before 100 BC many of the Cimbri, as well as the Teutons and Ambrones migrated south-east. After several unsuccessful battles with the Boii and other Celtic tribes, they appeared ca 113 BC in Noricum, where they invaded the lands of one of Rome's allies, the Taurisci. On the request of the Roman consul Gnaeus Papirius Carbo, sent to defend the Taurisci, they retreated, only to find themselves deceived and attacked at the Battle of Noreia, where they defeated the Romans. Only a storm, which separated the combatants, saved the Roman forces from complete annihilation. Now the road to Italy was open, but they turned west towards Gaul. They came into frequent conflict with the Romans, who usually came out the losers. In Commentarii de Bello Gallico the Aduaticii—Belgians of Cimbrian origin—repeatedly sided with Rome's enemies. In 109 BC, they defeated a Roman army under the consul Marcus Junius Silanus, who was the commander of Gallia Narbonensis. In 107 BC they defeated another Roman army under the consul Gaius Cassius Longinus, who was killed at the Battle of Burdigala (modern day Bordeaux) against the Tigurini, who were allies of the Cimbri. It was not until 105 BC that they planned an attack on the Roman Republic itself. At the Rhône, the Cimbri clashed with the Roman armies. Discord between the Roman commanders, the proconsul Quintus Servilius Caepio and the consul Gnaeus Mallius Maximus, hindered Roman coordination and so the Cimbri succeeded in first defeating the legate Marcus Aurelius Scaurus and later inflicted a devastating defeat on Caepio and Maximus at the Battle of Arausio. The Romans lost as many as 80,000 men, according to Livy; Mommsen (in his History of Rome) thought that excluded auxiliary cavalry and non-combatants who brought the total loss closer to 112,000. Other estimates are much smaller, but by any account a large Roman army was routed. Rome was in panic, and the terror cimbricus became proverbial. Everyone expected to soon see the new Gauls outside of the gates of Rome. Desperate measures were taken: contrary to the Roman constitution, Gaius Marius, who had defeated Jugurtha, was elected consul and supreme commander for five years in a row (104–100 BC). In 104–103 BC, the Cimbri had turned to the Iberian Peninsula where they pillaged far and wide, until they were confronted by a coalition of Celtiberians. Defeated, the Cimbri returned to Gaul, where they joined their allies, the Teutons. During this time C. Marius had the time to prepare and, in 102 BC, he was ready to meet the Teutons and the Ambrones at the Rhône. These two tribes intended to pass into Italy through the western passes, while the Cimbri and the Tigurines were to take the northern route across the Rhine and later across the Central Eastern Alps. At the estuary of the Isère, the Teutons and the Ambrones met Marius, whose well-defended camp they did not manage to overrun. Instead, they pursued their route, and Marius followed them. 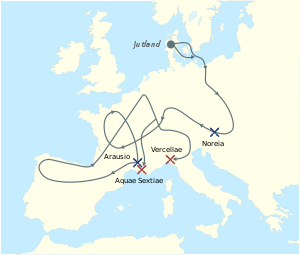 At Aquae Sextiae, the Romans won two battles and took the Teuton king Teutobod prisoner. The Cimbri had penetrated through the Alps into northern Italy. The consul Quintus Lutatius Catulus had not dared to fortify the passes, but instead he had retreated behind the river Po, and so the land was open to the invaders. The Cimbri did not hurry, and the victors of Aquae Sextiae had the time to arrive with reinforcements. At the Battle of Vercellae, at the confluence of the river Sesia with the Po, in 101 BC, the long voyage of the Cimbri also came to an end. It was a devastating defeat, two chieftains, Lugius and Boiorix, died on the field, while the other chieftains Caesorix and Claodicus were captured. The women killed both themselves and their children in order to avoid slavery. The Cimbri were annihilated, although some may have survived to return to the homeland where a population with this name was residing in northern Jutland in the 1st century AD, according to the sources quoted above. Some of the surviving captives are reported to have been among the rebelling gladiators in the Third Servile War. However, Justin's epitome of Trogus, 38.4, has Mithridates the Great state that the Cimbri are ravaging Italy while the Social War is going on, i.e. at some time in 90–88 BCE, thus more than a decade later, after having sent ambassadors to the Cimbri to request military aid; judging from the context they must then have been living in North Eastern Europe at the time. According to Julius Caesar, the Belgian tribe of the Atuatuci "was descended from the Cimbri and Teutoni, who, upon their march into our province and Italy, set down such of their stock and stuff as they could not drive or carry with them on the near (i.e. west) side of the Rhine, and left six thousand men of their company there as guard and garrison" (Gall. 2.29, trans. Edwards). They founded the city of Atuatuca in the land of the Belgic Eburones, whom they dominated. Thus Ambiorix king of the Eburones paid tribute and gave his son and nephew as hostages to the Atuatuci (Gall. 6.27). In the first century AD, the Eburones were replaced or absorbed by the Germanic Tungri, and the city was known as Atuatuca Tungrorum, i.e. the modern city of Tongeren. The population of modern-day Himmerland claims to be the heirs of the ancient Cimbri. The adventures of the Cimbri are described by the Danish Nobel Prize–winning author Johannes V. Jensen, himself born in Himmerland, in the novel Cimbrernes Tog (1922), included in the epic cycle Den lange Rejse (English The Long Journey, 1923). The so-called Cimbrian bull ("Cimbrertyren"), a sculpture by Anders Bundgaard, was erected on 14 April 1937 in a central town square in Aalborg, the capital of the region of North Jutland. A German ethnic minority speaking the Cimbrian language, having settled in the mountains between Vicenza, Verona, and Trento in Italy (also known as Seven Communities), is also called the Cimbri. For hundreds of years this isolated population and its present 4,400 inhabitants have claimed to be the direct descendants of the Cimbri retreating to this area after the Roman victory over their tribe. However, it is more likely that Bavarians settled here in the Middle Ages. Most linguists remain committed to the hypothesis of a medieval (11th to 12th century AD) immigration to explain the presence of small German-speaking communities in the north of Italy. Some genetic studies seem to prove a Celtic, not Germanic, descent for most inhabitants in the region that is reinforced by Gaulish toponyms such as those ending with the suffix -ago < Celtic -*ako(n) (e.g. Asiago is clearly the same place name as the numerous variants – Azay, Aisy, Azé, Ezy – in France, all of which derive from *Asiacum < Gaulish *Asiāko(n)). On the other hand, the original place names in the region, from the specifically localized language known as 'Cimbro' are still in use alongside the more modern names today. These indicate a different origin (e.g., Asiago is known also by its original Cimbro name of Sleghe). The Cimbrian origin myth was popularized by humanists in the 14th century. Despite these connections to southern Germany, belief in a Himmerland origin persisted well into modern times. On one occasion in 1709, for instance, Frederick IV of Denmark paid the region's inhabitants a visit and was greeted as their king. The population, which kept its independence during the time of the Venice Republic, was later severely devastated by World War I. As a result, many Cimbri have left this mountainous region of Italy, effectively forming a worldwide diaspora. Three carnyx players are depicted at right on plate E of the Gundestrup cauldron. The Cimbri are depicted as ferocious warriors who did not fear death. The host was followed by women and children on carts. Aged women, priestesses, dressed in white sacrificed the prisoners of war and sprinkled their blood, the nature of which allowed them to see what was to come. Their wives, who would accompany them on their expeditions, were attended by priestesses who were seers; these were grey-haired, clad in white, with flaxen cloaks fastened on with clasps, girt with girdles of bronze, and bare-footed; now sword in hand these priestesses would meet with the prisoners of war throughout the camp, and having first crowned them with wreaths would lead them to a brazen vessel of about twenty amphorae; and they had a raised platform which the priestess would mount, and then, bending over the kettle, would cut the throat of each prisoner after he had been lifted up; and from the blood that poured forth into the vessel some of the priestesses would draw a prophecy, while still others would split open the body and from an inspection of the entrails would utter a prophecy of victory for their own people; and during the battles they would beat on the hides that were stretched over the wicker-bodies of the wagons and in this way produce an unearthly noise. If the Cimbri did in fact come from Jutland, evidence that they practised ritualistic sacrifice may be found in the Haraldskær Woman discovered in Jutland in the year 1835. Noosemarks and skin piercing were evident and she had been thrown into a bog rather than buried or cremated. Furthermore, the Gundestrup cauldron, found in Himmerland, may be a sacrificial vessel like the one described in Strabo's text. The work itself was of Thracian origin. A major problem in determining whether the Cimbri were speaking a Celtic language or a Germanic language is that at this time the Greeks and Romans tended to refer to all groups to the north of their sphere of influence as Gauls, Celts, or Germani rather indiscriminately. Caesar seems to be one of the first authors to distinguish the two groups, and he had a political motive for doing so (it was an argument in favour of the Rhine border). Yet, one cannot always trust Caesar and Tacitus when they ascribe individuals and tribes to one or the other category, although Caesar made clear distinctions between the two cultures. Most ancient sources categorize the Cimbri as a Germanic tribe, but some ancient authors include the Cimbri among the Celts. There are few direct testimonies to the language of the Cimbri: Referring to the Northern Ocean (the Baltic or the North Sea), Pliny the Elder states: "Philemon says that it is called Morimarusa, i.e. the Dead Sea, by the Cimbri, until the promontory of Rubea, and after that Cronium." The contemporary Gaulish terms for “sea” and “dead” appear to have been mori and *maruo-; compare their well-attested modern Insular Celtic cognates muir and marbh (Irish), môr and marw (Welsh), and mor and marv (Breton). The same word for “sea” is also known from Germanic, but with an a (*mari-), whereas a cognate of marbh is unknown in all dialects of Germanic. Yet, given that Pliny had not heard the word directly from a Cimbric informant, it cannot be ruled out that the word is in fact Gaulish instead. The known Cimbri chiefs have Celtic names, including Boiorix (which may mean "King of the Boii" or, more literally, "King of Strikers"), Gaesorix (which means "Spear King"), and Lugius (which may be named after the Celtic god Lugus). Other evidence to the language of the Cimbri is circumstantial: thus, we are told that the Romans enlisted Gaulish Celts to act as spies in the Cimbri camp before the final showdown with the Roman army in 101 BC. Jean Markale wrote that the Cimbri were associated with the Helvetii, and more especially with the indisputably Celtic Tigurini. These associations may link to a common ancestry, recalled from two hundred years previous, though they may not. Henri Hubert states "All these names are Celtic, and they cannot be anything else". Some authors take a different perspective. Countering the argument of a Celtic origin is the literary evidence that the Cimbri originally came from northern Jutland, an area with no Celtic placenames, instead only Germanic ones. This does not rule out Cimbric Gallicization during the period when they lived in Gaul. Boiorix, who may have a Celtic name if not a Celticized Germanic name, was king of the Cimbri after they moved away for their ancestral home of northern Jutland; Boiorix and his tribe lived around Celtic peoples during his era as J. B. Rives points out in his introduction to Tacitus's Germania and moreover that the name "Boiorix" can work in Proto-Germanic as well as Celtic. ^ Vasmer, Russisches etymologisches Wörterbuch, 1958, vol. 3, p. 62; Z. Gołąb, "About the connection between kinship terms and some ethnica in Slavic", International Journal of Slavic Linguistics and Poetics 25-26 (1982) 166-7. ^ Posidonius in Strabo, Geography 7.2.2; Diodorus Siculus, Bibl. 5.32.4; Plutarch, Vit.Mar. 11.11. ^ C. Rawlinson, "On the Ethnography of the Cimbri", Journal of the Anthropological Institute of Great Britain and Ireland 6 (1877) 150-158. ^ a b Hussey, J. M. (1985). The Cambridge Medieval History. CUP Archive. pp. 191–193. It was the Cimbri, along with their allies the Teutones and Ambrones, who for half a score of years kept the world in suspense. All three peoples were doubtless of Germanic stock. We may take it as established that the original home of the Cimbri was on the Jutish peninsula, that of the Teutones somewhere between the Ems and the Weser, and that of the Ambrones in the same neighborhood, also on the North Sea coast. ^ "Celt". Encyclopædia Britannica Online. Retrieved 26 June 2018. The Germanic onslaught was first felt in Bohemia, the land of the Boii, and in Noricum, a Celtic kingdom in the eastern Alps. The German assailants were known as the Cimbri, a people generally thought to have originated in Jutland (Denmark). ^ "Germanic peoples". Encyclopædia Britannica Online. Retrieved 26 June 2018. By the time of Julius Caesar, Germans were established west of the Rhine River and toward the south had reached the Danube River. Their first great clash with Romans came at the end of the 2nd century bc, when the Cimbri and Teutoni (Teutones) invaded southern Gaul and northern Italy and were annihilated by Gaius Marius in 102 and 101. ^ Celtic Culture: A-Celti. ABC-CLIO. 2006. p. 437. ISBN 1851094407. ^ Kaul, F.; Martens, J. (1995). "Southeast European Influences in the Early Iron Age of Southern Scandinavia. Gundestrup and the Cimbri". Acta Archaeologica. 66: 111–161. ^ As a geologist, Strabo reveals himself as a gradualist; in 1998, however, the archaeologist B.J. Coles identified as "Doggerland" the now-drowned habitable and huntable lands in the coastal plain that had formed in the North Sea when sea level dropped, and that was re-flooded following the withdrawal of the ice sheets. ^ Ptolemy, Geography 2.11.7: πάντων δ᾽ ἀρκτικώτεροι Κίμβροι "the Cimbri are more northern than all (of these tribes)"
^ Beck, Frederick George Meeson (1911). "Cimbri" . In Chisholm, Hugh (ed.). Encyclopædia Britannica. 6 (11th ed.). Cambridge University Press. p. 368. ^ Sampson, Gareth S. (2010). The crisis of Rome: the Jugurthine and Northern Wars and the rise of Marius. Pen & Sword Military. p. 175. Retrieved 1 December 2012. ^ Strauss, Barry (2009). The Spartacus War. Simon and Schuster. pp. 21–22. ISBN 1-4165-3205-6. ^ James R. Dow: Bruno Schweizer's commitment to the Langobardian thesis. In: Thomas Stolz (Hrsg): Kolloquium über Alte Sprachen und Sprachstufen. Beiträge zum Bremer Kolloquium über „Alte Sprachen und Sprachstufen“. (= Diversitas Linguarum, Volume 8). Verlag Brockmeyer, Bochum 2004, ISBN 3-8196-0664-5, S. 43–54. ^ Pozzato, G; Zorat, F; Nascimben, F; Gregorutti, M; Comar, C; Baracetti, S; Vatta, S; Bevilacqua, E; Belgrano, A; Crovella, S; Amoroso, A. "Haemochromatosis gene mutations in a clustered Italian population: evidence of high prevalence in people of Celtic ancestry". Eur J Hum Genet. 9: 445–51. doi:10.1038/sj.ejhg.5200643. PMID 11436126. ^ A.A. Lund, Die ersten Germanen: Ethnizität und Ethnogenese, Heidelberg 1998. ^ Julius Caesar, Gallic Wars 1.33.3-4; Strabo, Geographica 4.4.3, 7.1.3; Pliny, Natural History 4.100; Tacitus, Germania 37, History 4.73. ^ Appian, Civil Wars 1.4.29, Illyrica 8.3. ^ Naturalis Historia, 4.95: Philemon Morimarusam a Cimbris vocari, hoc est mortuum mare, inde usque ad promunturium Rusbeas, ultra deinde Cronium. ^ Ahl, F. M. (1982). "Amber, Avallon, and Apollo's Singing Swan". American Journal of Philology. 103: 399. ^ Germanic has *murþ(r)a "murder" (with the verb *murþ(r)jan), but uses *daujan and *dauða- for "die" and "dead". ^ Accordingly, Pokorny, Indogermanisches etymologisches Wörterbuch, 1959, p. 735, describes the word as "Gaulish?". ^ Rawlinson, in Journal of the Anthropological Institute of Great Britain and Ireland 6 (1877) 156. ^ Markale, Celtic Civilization 1976:40. ^ Hubert, The Greatness and Decline of the Celts. 1934. Ch. IV, I. ^ a b c Ó hÓgáin, Dáithí (2003). The Celts: A History. Boydell Press. p. 131. ISBN 0-85115-923-0. ^ "Languages of the World: Germanic languages". The New Encyclopædia Britannica. Chicago, Illinois, United States: Encyclopædia Britannica, Inc. 1993. ISBN 0-85229-571-5. This long-standing, well-known article on the languages can be found in almost any edition of Britannica. "Cimbri" . The New Student's Reference Work . 1914. Kennedy, James (1855). "On the Ancient Languages of France and Spain". Transactions of the Philological Society (11).